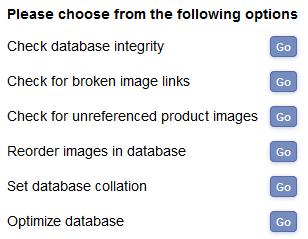 Admin database utility settings for shopping cart software from ECT. The admin database utility allows you to do some "housekeeping" on the database directly from your store control panel. You will need to be using the Firefox browser and the features available differ between the ASP and PHP versions. Be sure to make a back up of your database before fixing any database issues. This handy feature will check all your products for broken image links. 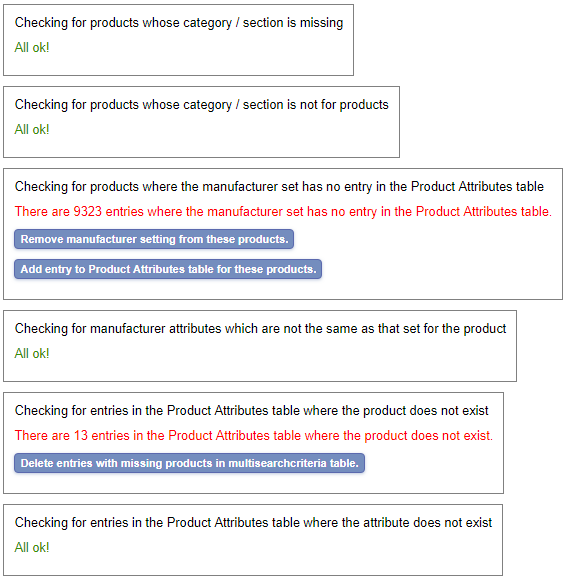 Once completed it will provide a table of products where the the image link is broken along with a link to the product in the admin making it simple to fix. Added in Version 7.0.4 this allows you to check images which are not associated to any product and if required, delete them via the admin. You will need to be careful with this feature as it will only check images associated to products and not general images on your site so please double check before deleting anything here. This is a streamlining / housekeeping feature to make sure the images in the database are in sequential order. This is more of an advanced feature and it allows you to set the collation of all the database tables and columns. Normally you wouldn't need to make any changes here but if you are having problems with character encoding for example this may be the simple way of fixing it. The most common collations are latin1_swedish_ci and utf8_general_ci. This utility will automatically optimize all the database tables for you. By default the database creation script used to use NVARCHAR for text fields. Now VARCHAR is used but databases that were created with the older scripts have the tables created with NVARCHAR. Switching to VARCHAR should improve the performance of the database.